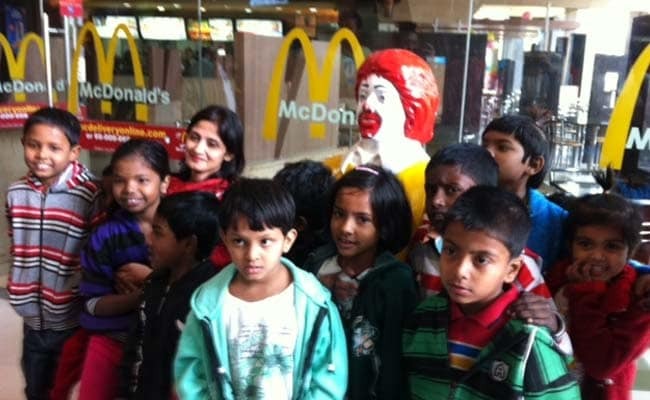 Kolkata: A day after reports emerged that McDonald's threw out a destitute child from its Pune outlet, an NGO took 15 underprivileged children to the fast food chain's outlet in Kolkata on Sunday and treated them to burgers and fries. "McDonald's should know that we will not tolerate the kind of discrimination they showed in Pune. We were angry at what happened and had to protest," said Ritu, a member of the NGO Committee for the Protection of Democratic rights (CPDR). "What was the problem in Pune? No one asked for a free meal. The lady who took the child in was going to pay for the food. So why did McDonald's evict the child ?" said Suraj Chokhani, another CPDR member. When the children marched in at 11:30 am, the staff at McDonald's at Mani Square Mall were courteous. One of them even arranged balloons for all the 15 children. The children, all of whom live in a slum or 'basti' nearby, had a great time, little knowing perhaps that they were part of a strong statement against discrimination. "This is very tasty, I am very happy I am here," said Parul, a Class 3 student biting into a chicken burger. A tiny tot, Titi, exclaimed while eating french fries, "This is like alu bhaja my mother makes at home." 'Alu bhaja' or fried potato is a staple at Bengali homes. "We also felt bad about what happened at Pune. Whatever their parents' financial background, kids are kids," one of the staff members said on condition of anonymity. McDonald's has launched an investigation into the Pune incident and said it does not support discrimination of any kind.